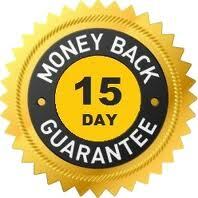 VibrationWarehouse.com is so confident that you will love your vibration machine that we offer a full 15 days satifaction guarantee trial period. If for any reason you want to return the vibration machine you purchased, you may return it for a full refund within 15 days of the delivery or purchase date, whichever is later. Shipping costs are non-refundable and for machines that have shipping included, the shipping amount will be deducted before the full refund is issued. Please be advised that the shipping costs associated with sending the machine back to our warehouse is also the customer’s responsibility. VibrationWarehouse.com does not charge any restocking fees for any vibration machines that are returned. In the rare instance that your order arrives defective or damaged, please take a picture of the defect or damage and send it to support@vibrationwarehouse.com along with your order number and first and last name. Please explain in the email what the defect is and we will respond with an email letting you know how we are going to handle the situation. We offer a 120% Low Price Guarantee to make your vibration machine purchase worry-free. We're so confident that our prices are the best online that we're willing to put money on it!